It has been revealed that the tense situation created in Parliament on the 10 had been premeditated states the Speaker’s office. In an announcement, the Speaker’s office states the security section in Parliament has received a confidential report that there had been a plan to disrupt proceeding in Parliament that day. The confidential report had been received by the Speaker as well states the announcement. Despite the Speaker announcing that the copies of the bond report would be made available on the 17th the members of the Joint Opposition, instigated by Parliamentarian Dinesh Gunawardena and several other Parliamentarians, invaded the Well of the House and obstructed the proceedings shouting at the Prime Minister states the announcement. Colombo High Court Judge Sampath Abeyakoon has ordered that the case filed by the Attorney General against Namal Rajapaksa and five others under the Money Laundering Act to be taken up for hearing on 6th February. The case was put off for the 6th February when the counsel representing Attorney General asked time to present documents related to the case to the defendants. The case has been filed against Mr. Namal Rajapaksa and others for their alleged involvement in a financial transaction worth Rs. 30 million, between Gowers Corporate Services (Pvt) Limited owned by Namal Rajapaksa and another company. The accused Parliamentarian Namal Rajapaksa, Pavithrika Sujani Bogollagama, Nithya Senani Samaranayaka, an Air Hostess, and Ornella Iresha Silva have been released on bail while the other accused Indika Prabhath Karunajeewa is absconding. The essence of the speeches by the President these days is punishing fraudsters and stopping stealing. Mahinda Rajapaksa too talks of stopping stealing. Mahinda says he would stop his candidates from taking contracts once they are elected to local councils. UNP talks about stopping stealing and corruption as well. These days the most valuable slogans are that of against frauds and corruption. For, large-scale frauds and corruption are the main issues in our country. What is pathetic is fraudsters and the corrupt themselves attempt to take the right of stopping frauds and corruption to their hands. This would confuse the mentality against frauds and corruption. Hence, we would like to tell the people in this country to judge these political parties not from what their leaders say but from their action; judge them from their practice. We ask the people to understand who could stop frauds, corruption and waste and give the power of their villages to them,” says the General Secretary of the JVP Tilvin Silva. He said this at a press conference held at the head office of the JVP at Pelawatta today (15th). The Member of the Central Committee of the JVP Attorney in Law Sunil Watagala was also present. Speaking further Mr. Tilvin Silva said, “About half the election campaign has been concluded. The election this time has a special characteristic. The election is held under a new system. As such, this election is a new experiment. Conflicts have been reduced and the contest has been restricted to the ward as the election elects a member for the ward. Among the themes of the election the theme ‘against frauds and corruption’ has come above others. The reason is all local government councils in eh country have been full of frauds and corruption. Almost all candidates of other parties want to get elected to engage in frauds and corruption. The membership of a council has become a license for them to steal. Mayors, chairmen and vice-chairmen who had ruled these councils have committed large-scale crimes. They continue to engage in such crimes. A few days ago it was revealed that a vice-chairman of a council had been arrested cutting satinwood trees. Another candidate was caught with 32 kilograms of cannabis. Another has been arrested while distilling illicit liquor. They seek election to facilitate their criminal moves. They scuffle to get nominations to carry out their frauds and corruption. It is this environment that has intensified the voices of people who are against frauds and corruption. 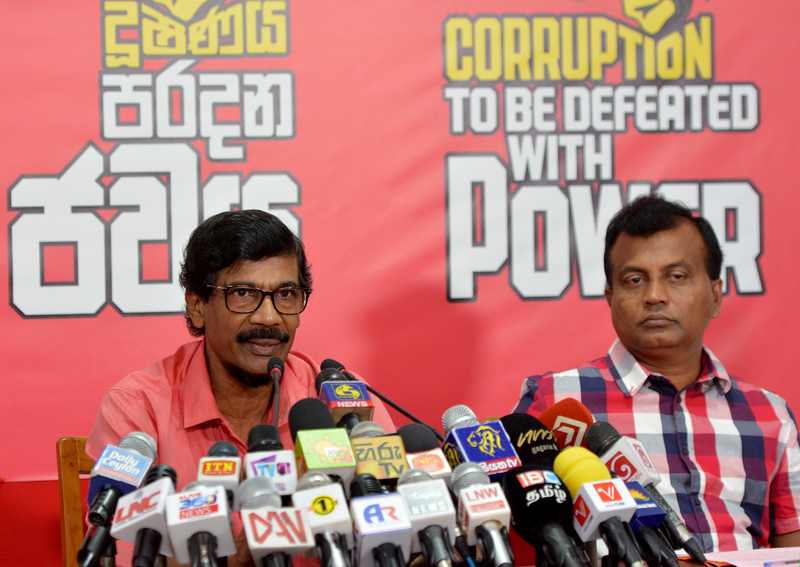 The election theme of the JVP this time is ‘Power to develop village and defeat corruption’. It is necessary to elect those who have the strength to defeat corruption and develop the village. At the commencement of our campaign, we called all our candidates to Sugathadasa indoor Stadium and pledged to take action to stop frauds and corruption. For, only the JVP can stop fraud and corruption as none in the JVP is connected with frauds and corruption. Other parties held conventions after us. They also pledged to stop fraud and corruption. The summary of the speeches by the President too is catching fraudsters and stopping stealing. Mahinda Rajapaksa’s candidates have been asked to stop taking contracts after they are elected to local councils. UNP talks about stopping stealing and corruption as well. These days the most valuable slogans are that of against frauds and corruption. For, large-scale frauds and corruption are the main issues in our country. What is pathetic is fraudsters and the corrupt themselves attempt to take the right of stopping frauds and corruption to their hands. This would confuse the mentality against frauds and corruption. Hence, we would like to tell the people in this country to judge these political parties not from what their leaders say but from their action; judge them from their practice. We ask the people to understand who could stop frauds, corruption and waste and give the power of their villages to them. The biggest theft of the government that came to stop thefts is the bond scam. The main promise this government made to the people is catching thieves. Three years have gone by but there is only talk about investigations by commissions. Only two thieves were punished. Lalith Weeratunga and Vajira Palpita were given three-year rigorous sentences for distributing ‘sil’ clothes. But what happened? They were given bail and now they are at home. As such, this is not a government that catches thieves. The Bond Commission pointed out there had been a fraud of Rs. 11,145 million. Its not necessary to waste time if there was a real necessity to punish bond thieves. COPE carried out an investigation and amidst obstructions from UNP members in it a report was presented to parliament. This report has been handed over to the Attorney General. However, no legal action has been taken. The bond commission carried out its investigations in public. However, the President is avoiding disclosing it. This report is one that the people require. It is also required by the parliament. For, the report is about how people’s money has been stolen. The parliament is responsible for people’s money. As such, the parliament should know what is in the report. However, this report is being used for President’s political agenda. Before the bond commission, a Presidential Commission of Inquiry was appointed to investigate and inquire into serious acts of fraud, corruption and abuse of power (PRECIFAC). This commission has handed over 34 reports to the President. Where are those reports? Now, these 34 reports have been buried under the bond report. The reason is the bond report mentions stealing by the UNP. However, the report by PRECIFAC would expose frauds of the people around the President. This is why these reports have been concealed. This shows appointing commissions and carrying out investigations are used for their political agendas. These commissions are appointed not to punish perpetrators. We demand the President reveal all 34 reports immediately. The President made a special revelation about a special fraud about a year ago. He said funds were passed for the Nilwala project a day before the presidential election held on 8th January 2015 and not even a soil clod was cut from the funds allocated said the President adding that the fraudsters would be punished. He made this speech and became a hero before the media. Now, no one remembers this theft and there are no investigations. Mr. Nimal Siripala de Silva was the Minister of Irrigation when this theft took place. However, Nimal Siripala is now with Maithripala. Investigations regarding frauds and corruption should not be made political games. Now there is an attempt to appoint a presidential commission regarding Srilankan and Mihin Air. There has been a massive fraud in the two institutions. It was managed by Mr. Mahinda Rajapaksa’s brother-in-law. They managed it as a family asset. Billions of public money were wasted. Appointing commissions to attack President’s opponents would not be a correct act. We ask the President to punish fraudsters without making investigations a political game. It is evident that both these groups are fraudsters. Fraudsters cannot stop frauds and corruption. In short, thieves cannot give up stealing. Those who have been in power cannot stop corruption though they ask for power again. If the people are ready to learn lessons they had a good experience in Parliament recently. When the Prime Minister got ready to make a special statement regarding the bond scam in Parliament Mahinda Rajapaksa’s group started shouting, “Ranil, the thief!” Ranil Wickremesinghe, with his group, started shouting, “Mahinda, the thief!” Some MPs shouted, “tsunami thief” while others shouted “bond thief”. Both these groups are thieves. The only group that did not get involved in the melee was the JVP group of MPs. Discipline in a country could be established only by example. How could a group that behaves like thugs promote discipline? None of these groups can call JVP thieves. For, JVP does not have any thieves. There are no accusations against us and there are no commissions against us. It’s because the JVP doesn’t have thieves in it. Hence, only the JVP could stop frauds, corruption and waste. These days the President does various things to be popular. The Ministry of Finance issued a gazette to remove the ban on wine stores to sell liquor to women and to allow wine stores to be kept open till 10.00 p.m. These are decisions taken at ministerial level. Such decisions are taken after discussing in the cabinet. However, the President, at a propaganda meeting, says he would cancel this gazette notification. He says he came to know about the gazette notification only from newspapers. How could a president who knows what happens in the country only from the radio, newspapers or the TV administer the country? How could a decision that was taken in a Ministry and the cabinet be cancelled at a public meeting? Hence, we tell the President that a country cannot be administered by listening to the radio or watching TV. Decisions cannot be taken at public meetings. We are sorry that we have such a president in the country. These could be gimmicks to get popular. Hence, we ask the people not to get deceived by these displays. On 10th February administrators for 341 local government councils would be elected. These councils are responsible for issues of the people from their birth to death. Also, these councils receive a lot of funds through taxes and fines. The responsibility of local government councils is to manage these funds and use them for the service of the people. However, various groups attempt to deceive people to get their votes. These local councils should be made free of frauds, corruption and waste and make them institutions that serve the people. The UNP, the SLFP or the new parties cannot do that. Only the JVP could eradicate corruption and build a genuine people’s administration to serve the people. We ask the people to trust the JVP and give us more power in local government councils.